PCB Piezotronics: Larson Davis, a division of PCB Piezotronics, announces that a new Sound Level Meter Software, SLM Utility G4, is now available as a free download on their website. Designed to be used with the Model 831 and LxT sound level meters, this utility provides a modern interface that will enhance the user experience when setting up the sound level meters or when analyzing data. Also shipped with new products, this software enables users to work more efficiently with the Model 831 and LxT sound level meters by supporting simultaneous control of multiple meters. The G4 utility allows consultants and engineers to easily share setups, download and display data, and export to Excel® files through a USB or Internet connection. The standard software is 64-bit to support large data files and work efficiently on newer computers although there is also a version available for 32-bit computers. 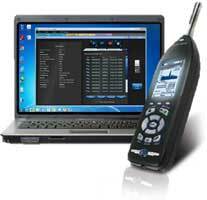 SLM Utility G4 is supported by Larson Davis when running on Windows® XP, Windows® 7 and Windows® 8 platforms. SLM Utility G4 has been designed to replace SLM Utility G3 and future new features will be made available only in SLM Utility G4. For other service or product information, contact Product Manager Ken Cox at (716) 684-0001 or kcox@pcb.com. Larson Davis, a division of PCB Piezotronics, offers a full line of Noise and Vibration measurement instrumentation; including Type 1 sound level meters, personal noise dosimeters, octave band, audiometric calibration systems, microphones and preamplifiers, hearing conservation software, and Human Vibration Exposure Monitors. Products are used for measurement of building acoustics, community & environmental noise monitoring, as well as supporting various automotive, aerospace and industrial applications. Larson Davis proudly stands behind their products with the services you value most, including 24-hour technical support, a global distribution network, and the industry's only commitment to Total Customer Satisfaction. Visit us at www.larsondavis.com. PCB Piezotronics is a designer, manufacturer, and global supplier of accelerometers, microphones, and force, torque, load, strain, and pressure sensors, as well as the pioneer of ICP® technology. This instrumentation is used for test, measurement, monitoring, and control requirements in applications for automotive, aerospace, industrial, energy, R&D, military, educational, commercial, and OEMs. Our Platinum Products are covered by a lifetime warranty and are ready for immediate shipment. With a customer support team of more than 30 Customer Service Representatives and Application Engineers, PCB® proudly stands behind their products with services that include a 24-hour technical support, a global distribution network, a best in class warranty and the industry's only commitment to Total Customer Satisfaction. Visit us at www.pcb.com. PCB and ICP are registered trademarks of PCB Group, Inc.
Excel® and Windows® are either registered trademarks or trademarks of Microsoft Corporation in the United States and/or in other countries.